Welcome back! This week’s author interview is with the talented Marc Abbott. Marc is the author of A Gamble of Faith, The Hooky Party, and Etienne and the Stardust Express. He is also an acclaimed filmmaker and actor with his work appearing in numerous film festivals including the New Jersey Horror Con Film Festival and the Coney Island Film Festival. 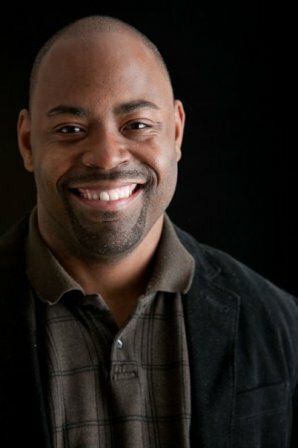 Recently, Marc and I discussed his evolution as a writer, how his work in film and acting impact his fiction, and what his future writing plans include. I have always loved writing ever since I was young. I used to get into trouble in grade school because instead of paying attention in class, I was writing short stories in my notebook. But it wasn’t until I got to HS that I realized I wanted to do it as a profession. Being a movie buff, I just knew that what I wanted to do was write movies and TV shows. But I also liked to get immersed in novels and short stories. I was a big Stephen King and Clive Barker fan and I was always reading one of their books. Especially their anthologies. I was also a Peter Benchley fan as well. I loved how he could take us inside the head of the creatures he wrote about like Jaws and The Beast. After college, I began taking the craft more seriously and started writing with the intention to become published. We met earlier this year at StokerCon when we shared a reading time slot. I absolutely loved your story, which featured a very feisty cat and dog fighting a creature that lived in the dark. Can you share a little bit about that story? Ah, Poohbear and Smokey. Both animals are based off of pets I knew. Poohbear was my neighbor’s dog, Smokey was based off my cat, Hobbs, both of whom have passed on. The idea for this came to me several years ago when I noticed my cat would suddenly jump up and start meowing at nothing then give chase to whatever it was he saw around the house. There is always this talk about how animals can see into the spirit world and I thought “What if our pets, at night, were protecting us from forces beyond our sight. Is that why cats sit in doorways? 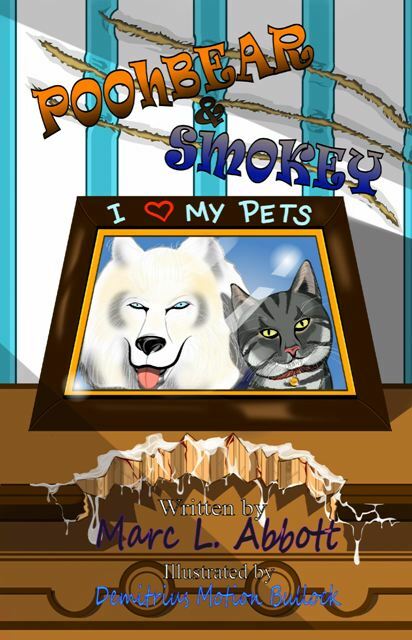 Dogs sleep at the foot of the bed?” and so I designed this story where the pets fought off evil spirits. In the beginning I wasn’t sure what the enemy would be. But then I remembered growing up thinking something was living in my closet. Rather than make the enemy a spirit I chose an old fashion demon, not really the boogeyman but something equally dangerous. The relationship between the cat and dog was based on my aunt’s own pets who, before they passed, shared a very close bond with one another. Up to the point that when the dog passed, the cat mourned him and would sit in front of the dog house meowing. I used that for the basis that these two animals could communicate and watch one another’s back. And of course the fact that they team up to fight a monster that only a child can see and are chastised by the adults for being wild, that just added to flare and realness of how pets really are in our world. You’ve written both novels and short stories. Do you prefer one length to another, or do both appeal to you more or less equally as an author? Also, do you consider one length of fiction more challenging than the other? I love novel writing because I can get lost in the world I am creating and bond with my characters. I feel like I can take my time and let things grow. Short fiction I would say is more challenging. For one thing I tend to pour everything into a short story that I don’t have to. Reason being is that when people ask me questions about a short story and I give the back story answer they always say I should have put that in the story. Short Fiction is also more difficult to edit. I never know what to take out. I do enjoy the fact that with a short story I can get to the punch quicker but it does present a greater challenge. You’re a fiction writer, a filmmaker, and a playwright. How is your approach to writing similar or different across mediums? I approach the majority of my work through dialogue first. I like to get into the mind and mouth of my characters early because it’s a perfect way to define them. That being said, when it comes to novel writing, much of my work has started out as a screenplay first. I write the dialogue and actions of the characters first then go back and fill in the rest of the story. Since I don’t have to concentrate as hard on backgrounds, world building and that sort of thing in my scripts and screenplays, I can stick to the same format of writing across the board. Once I go back to fill everything in, that’s when things become different because in a book, I have to give the reader the information so that they can visualize it in their minds. On stage and screen, it’s all right there for them to see. You don’t need to use your imagination there unless it’s a scene that you don’t show but allow the audience to create the scenario in their minds. Just to add to your illustrious resume, you’re also an actor! Do you feel that performing in front of the camera has helped you with doing live readings as an author? Also, do you feel like being an actor and becoming familiar with the inner workings of dialogue has helped you craft dialogue in your fiction? Absolutely. Live readings are performances. When acting I’m interpreting a story someone else has written. But when I read, I’m telling a story I am very close to. I know how the characters sound, how they behave and I get a kick out of being able to voice them. For me, I often talk out sequences in my books. I will literally get up and act out the sequences alone if I get stuck. Having been on stage and screen, I kind of know from a directing standpoint how to direct myself when I do that. So it helps to act it out sometimes because then I get to understand my characters better and know which way I want to go with a story. Dialogue, for me, is one of the most important parts of any story. So when I read my work at events, I like to get into those characters and give different voices so people aren’t just hearing me talk, they’re in the story with the characters and feel for them. If forced to choose, which part of the writing process is your favorite: drafting new ideas, writing a first draft, or polishing an almost finished piece? Hands down it’s writing the first draft. Finishing a first draft always feels so good. I often treat myself with coffee and a slice of cheesecake when I’m done. Something about fleshing out all the ideas and making it whole is gratifying. Polishing is always a daunting task. I don’t enjoy it as much. It seems to take so much longer and after awhile I start to get tired of dealing with the same characters so I have to walk away from it, which takes up more time. Drafting new ideas, always fun but not as gratifying. Right now I’m working on an anthology with a fellow writer, Steven Van Patten. I don’t want to get into the logistics of it but it’s a horror anthology with a twist. 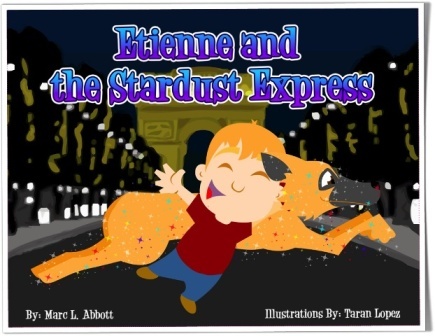 And most recently, I launched a children’s book called Etienne and the Stardust Express. The Dead Syndicate, which is out of print at the moment, was my personal favorite. I spent several years working on that book with a sequel in mind so it was the one most near and dear to my heart. You can find me at my website www.whoismarclabbott.com and follow me on Facebook Who Is Marc L Abbott? Tremendous thanks to Marc Abbott for being part of this week’s author interview series! This entry was posted in Fiction, Interviews on September 12, 2018 by gwendolynkiste.